The main house has 168m2 of charming living space. Ground floor: large living room facing south with corner kitchen and dining area, sitting room with beautiful fireplace and log burner, and dining room with another lovely fireplace. A hallway leads to shower room, WC and storeroom and adjoining outbuilding. The guest house with 48m2 living space comprises on the ground floor: a kitchen open onto the living room with fireplace and insert stove, shower room with WC. First floor: bedroom and study. 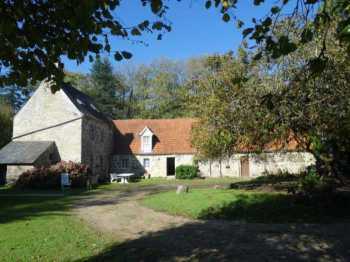 An old stable, currently used for storage and workshop is situated at the end of the main house, with access communicating with its loft and also with the first floor. This offers potential to renovate with a number of possibilities. Other outbuildings: little creche, lean to for animals. The land of 89,000m2 is well maintained: pastures fenced for about 2 hectares and the rest mostly woodland. Great charm for this renovation realised about 20 years ago and only 10 minutes to the beaches and the sea!